Since I bought this domain, I did almost neglect. One of reason is my laziness. I just built portfolio page tonight. This is a one little step forward for me. I can say it’s not that difficult now. But, I figured out how difference with menu, category and page on this wordpress blog system few days ago. My portfolio page is here. I had pain my shoulder and arms through last winter to spring. I didn’t knit almost 6 months. Maybe this in an another reason that I didn’t take care of this blog. I started knit again this early summer. But, I don’t do long time. I’m tring to take a rest often because I want to enjoy knitting as long as possible. I’m knitting triangle shawl inspired from the pattern titled ‘starlight’ of Treasury of Knitting Patterns by Barbara G. Walker. It’s triangle shawl but it has almost crescent shape. I’m using Red Heart Stardust for sample. 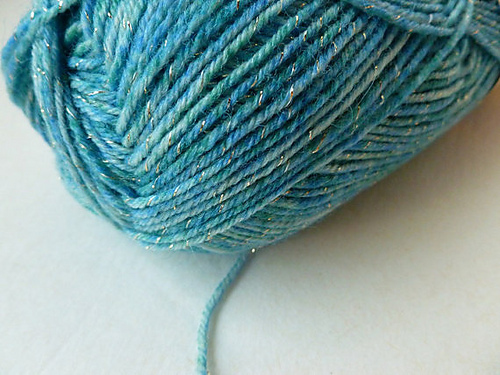 This is a super fine weight sock yarn has 5% metallic thread. 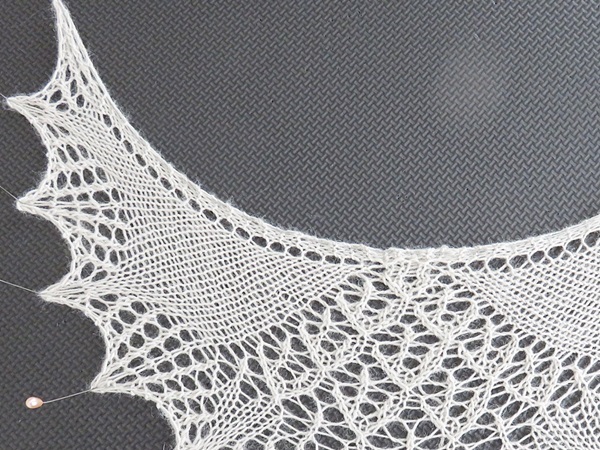 I might be update my indie pattern on the Ravelry and Craftsy. Also, I would love to add pattern store page on this blog. This is almost 1/5 size sample swatch I made a month ago. It was very difficult to find right yarn. Stardust is cheap and find easily at the walmart and Michal’s. Progress is almost 45% now. Wish to finish within this month. Also, I’m updating my yarn stash folder on Ravely. I tried to built stash file used Excle program. But, Ravelry stash option is much better than that. I have no idea How much yarn I have. I must stop buying yarn. It’s not easy. 이 도에민을 구입한 뒤로 주욱 방치 했었습니다. 게으름이 여러 이유중 하나일수도 있겠지요. 조금전에 포트폴리오 페이지를 완성했습니다. 이제 작은 한 발자국을 뗀 셈이랄까요? 지금이야 그닥 어렵지 않다고 말할수 있지만 메뉴와 페이지 카테고리가 어떻게 다른지 겨우 며칠전에야 알게된것이 비하면 꽤 고생을 한 셈이긴 해요. 포트폴리오 페이지는 ‘여기‘ 입니다. 겨울과 봄을 지나며 어깨와 팔에 심한 통증을 느꼈고 거의 반년간 뜨개질을 하지 못했습니다. 어쩌면 이것도 블로그를 방치하게된 이유중 하나일거예요. 늦봄과 초요름에 들어서면서 조금씩 뜨개질을 다시하기 시작했습니다. 요샌 오랫동안 하지는 않아요. 중간중간 쉬는시간도 자주 가지구요. 아주 오래도록 할머니가 되어서도 뜨개질을 하고 싶거든요. 최근 시작한 것중에는 삼각숄이 하나 있습니다. 바바라 G 월커여사의 패턴책에서 발견한 Starlight 별빛이라는 이름의 패턴을 넣은 숄이예요. 구조는 삼각숄의 형태이지만 완성된 모양은 거의 초승달 모양이 될 예정입니다. 레드하트의 스타더스트라는 양말실을 사용하고 있는데 메탈릭실이 한가닥 들어가 있어요.. 월마트나 마이클스 같은데서 쉽게 구입할수 있는 저렴한 실인데 꽤 잘 어울려서 만족 스러워요. 완성되면 인티패턴으로 Ravelry와 Craftsy에서 판매를 하려고 합니다. 블로그의 패턴가게 페이지에도 업로드를 할 예정이예요. 샘플 스와치는 1/5 사이즈 정도 되는데 약 한달전에 만들었어요. 숄은 45%정도 진행된 상태이고 무리하지 않으면서 쉬엄쉬엄 하는 중입니다. 이달안에 달리 바쁜일이 없으면 끝낼수도 있을것 같아요. 겸사겸사 Ravelry의 stash실창고도 업데이트 하고 있어요. 원래 엑셀로 정리를 하려고 몇번 시도를 했었는데 실을 정리하는 속도가 사는 속도를 따라가지 못해서 포기를 했었거든요. Ravelry의 실창고 기능이 여러모로 편리한것 같아서 시간은 좀 걸리겠지만 꾸준히 올려 보려고 해요. 실을 그만사야 하는데 그게 쉽지가 않습니다.